Yesterday, I decided to go to the grocery store to buy snacks and something to prepare for dinner. It's my first time to walk around the streets of Pasay and I am still coping up with the milieu. 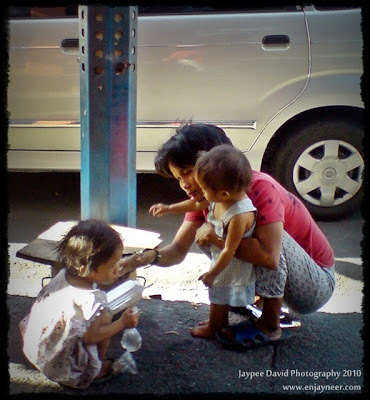 Poor and malnourished families, especially the children are everywhere begging for food and money to people they meet. I can't believe how the government is dealing with this kind of situation. I think, the authorities should focus more into providing and promoting education to the Filipinos more importantly to the poor communities. Send everyone to school (along with a feeding program) and I am sure we will see progress in the next few years or so.